Hi everyone! Jenn back from Deliciously Sprinkled! I hope you are all having a great summer so far, I know I have been enjoying my summer so far and I especially love to visit our local farmers market to stock up on all the delicious, fresh vegetables and fruits, like these strawberries I used in today’s Strawberry Banana Bread. 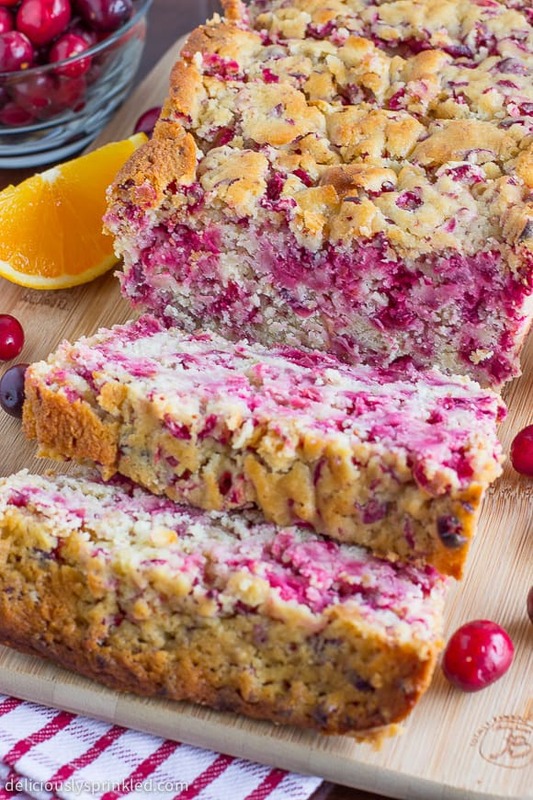 This bread is a simple to make quick bread perfect for breakfast or as a snack! 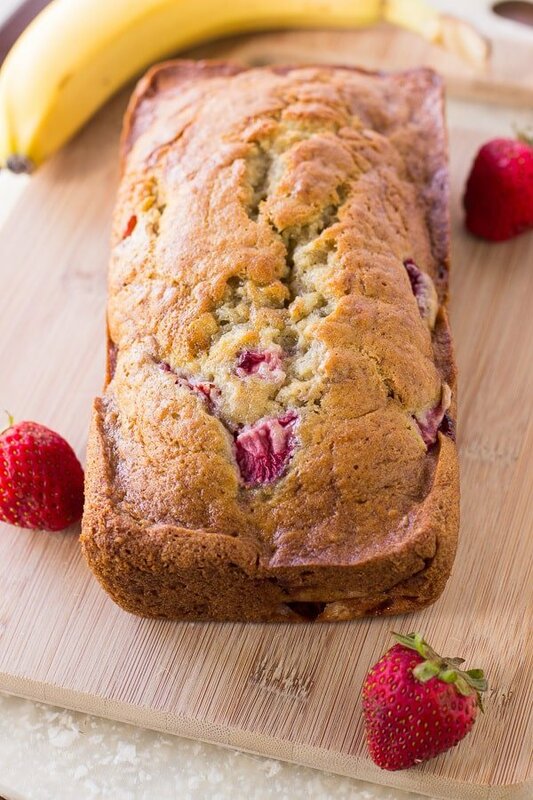 I love banana bread but when you add fresh strawberries it takes this bread to a whole new level of deliciousness! And when this bread is baking in the oven, it makes your house smell amazing. 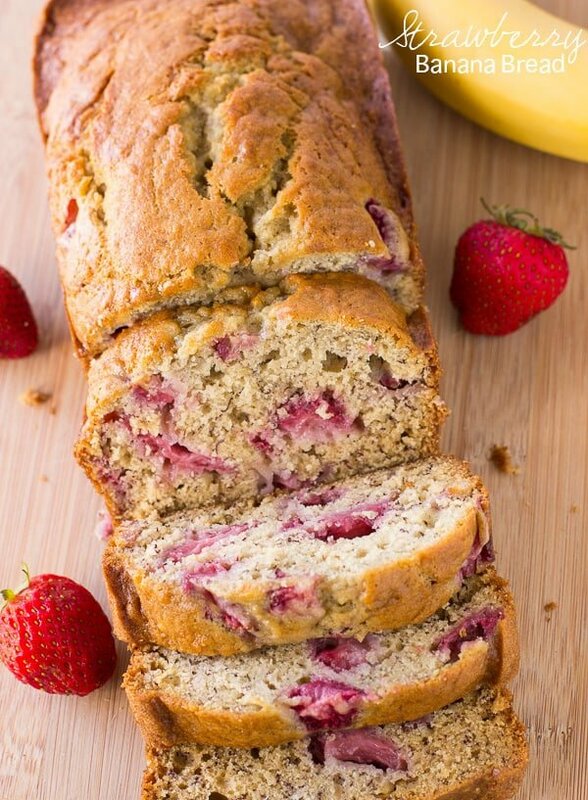 So the next time your at your local farmers market or store, don’t forget to pick up some fresh strawberries and bananas so you can make this delicious bread. I know your going to love it! In a large bowl, using a KitchenAid Stand Mixer with paddle attachment cream butter and sugar together until light and fluffy. Could I omit the strawberries and just make a banana bread? I am not sure if it would come out moist without the strawberries. I’m thinking the people having issues with height and texture are probably not beating the butter and sugar until light and fluffy. If not bakers they don’t understand how important these steps are. Mine turned our fabulous. I also added some vanilla paste and a little extra salt. Flavor lovely. Made this today and love it! Substituted coconut oil for butter as well as for greasing the pan. I had two loaf pans prepared, but only used one. It came out delicious! I also used 3/4 C. coconut sugar instead of 1 C. white sugar. If I make again, however, I will add an additional cup of strawberries, as I love the moist strawberry bites & would like even more! This is delicious! I used thawed frozen strawberries from last year and some frozen bananas I had, they worked great! Chop the berries up coarsely. This only makes one loaf in a regular size bread pan, not two. I baked it at the higher temp as directed and then about 45 minutes at the lower temp in a convection oven. Perfect. I’m using a convection oven, also & followed the direction on-spot (using blueberries, though). Yes, it made only 1 loaf-pan, but after cooking 375 for 15min, it’s now been in the oven 35min @ 350 & is still very gooey in the middle, yet perfectly brown on the outside. I’m trying to cover w/ foil to prevent burning & placed in another 20min @ lower temp … hopefully this works. Can you use frozen strawberries and frozen banana instead of fresh? Love some of your recipes, but could you please put metric measurements for the ingredients in aswell? I live in the UK and we dont use cups. Thanks. would like to know how to make without a stand mixer? If you are using a hand mixer it would be the same, if you are having to mix it by hand the same just a little more work on your arm. You can use either. I prefer plain all-purpose flour. I have made this at least a half dozen times, I buy extra bananas just for this recipe. I experimented a few times with blueberries instead of strawberries and it is equally as delicious. In fact half my family is Team Strawberry and the other is Team Blueberry. I think the next time I make it, I will do a pan with each fruit to please everyone. I made the strawberry banana bread, and it was amazing. Thank you so much. Made this for the 1st time and my family loved it! Need to make this again but with blueberries! Really love this delicious recipe, thank you! 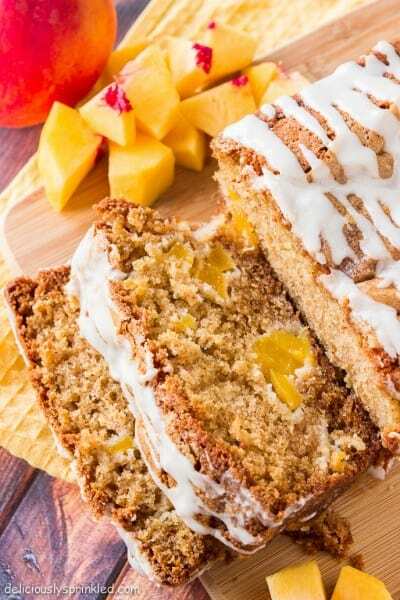 I love Banana cake! This sounds like a really great way to eat it too! 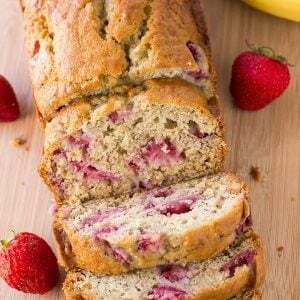 the strawberry banana bread is awesome. I made this recipe this morning and my husband and I really enjoyed it. It was flavorful and a great way to use up some bananas and strawberries we had. I was unsure whether it would make two loaves as the recipe indicates based on the comments but it did make two loaves. Just divide the batter evenly in the pans and it will rise due to the baking soda. My cooking time was a little longer than the recipe called for but every oven is different so no big deal. I made muffins. Half the recipe yields 10 muffins (now 9 because I already ate one!). I baked them at 375 for 33 minutes. They are moist and delicious. Thanks!! I am so glad that you like them. Thanks for taking the time to comment and share. Thanks for following along with me! I made the 1st time as directed & my boyfriend ate the entire loaf in 1 day … this time w/ blueberries! I use raw sugar, so the “light & fluffy” aspect isn’t there & use a hand-mixer only. I have no idea what “over mix” means visually, but it still turns-out moist & beyond delicious!